Gibson Century of Progress Model Flat Top Acoustic Guitar, c. 1935, made in Kalamazoo, Michigan, sunburst lacquer finish, maple back and sides, spruce top; mahogany neck with rosewood and celluloid fingerboard, original black - red line hard shell case. 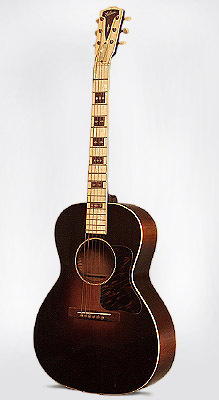 The L-C "Century of Progress" model is one of Gibson's most unusual acoustic guitar designs, and one of the most visually striking flat-top guitars of any era. Combining a 14 3/4" curly maple body with flashy pearloid ornamentation on the neck, the Century is visually somewhat reminiscent of a 1920's tenor banjo, and a distinctive-sounding guitar in its own right. The maple back and sides give the L-C a crisp, powerful sound perfectly suited to fingerpicking and ragtime; when played with a pick the guitar is both loud and bright enough to play rhythm in a small dance combo. The body is single bound top and back, with golden sunburst on all surfaces. The softly V-shaped mahogany neck is also subtly sunbursted. Tuners are strip plastic-button Grovers as seen on L-0's from the same era; the pearloid headstock and fingerboard are bound in black and white ivoroid. Pearl diamonds are set in rosewood blocks in the celluloid fingerboard, creating a dramatic three color visual scheme for the neck which nicely offsets the dark sunburst top. Soundhole ring is 3-ply; the pickguard is Gibson's striking pre-war firestripe tortoise celluloid. This is a relatively early example of the Century, with a smaller sunburst area on the top probably from around 1935. The model was introduced for the "Century of Progress" exhibition in Chicago in 1933, and was only produced until around 1939. The L-C was popular with many Hillbilly and Radio Cowboy acts of the 1930's, including the Girls of the Golden West and Mainer's Mountaineers. This beautiful example is complete with the original red-line black hard case with purple lining -- with even the handle intact. Overall length is 40 in. (101.6 cm. ), 14 3/4 in. (37.5 cm.) wide at lower bout, and 4 1/2 in. (11.4 cm.) in depth at side, taken at the end block. Scale length is 24 3/4 in. (629 mm.). Width of nut is 1 3/4 in. (44 mm.). Overall a very clean and original guitar; one neatly repaired top crack behind the bridge and one small area of truss rod compression on the back of the headstock with an enigmatic number (010) stamped directly above it. Plays and sounds extremely well. Generally Excellent Condition.